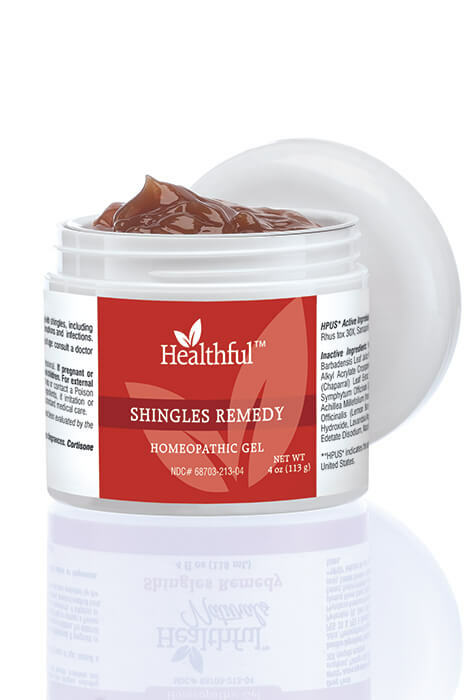 Healthful™ Naturals Shingles Remedy helps manage shingles symptoms. Concentrated homeopathic remedy helps temporarily relieve pain, lesions, itching and burning associated with the shingles virus, without interfering with other medications. As active ingredients Croton tiglium, Natrum muriaticum, Plantago major, Rhus tox and sarsaparilla ease pain, itching and eruptions, its natural herbs and extracts soothe and support skin health and healing. Safe, natural shingles treatment is not tested on animals and contains no parabens, petroleum, cortisone, or artificial colors or fragrances. Apply to affected areas as needed. Do not use if allergic to soy. 4 oz. tub is a great value! Helps temporarily relieve pain, lesions, itching and burning associated with the shingles virus. Active ingredients: Croton tiglium, Natrum muriaticum, Plantago major, Rhus tox and sarsaparilla. Natural herbs and extracts soothe and support skin health and healing. Not tested on animals and contains no parabens, petroleum, cortisone, or artificial colors or fragrances. Inactive Ingredients: Purified Water, Phytolacca Americana (Poke) Berry Extract, Aloe Barabadensis Leaf Juice, Phenoxyethanol & Caprylyl Glycol & Sorbic Acid, Acrylates/C10-30 Alkyl Acrylate Crosspolymer, PEG 33 & PEG 8 Dimethicone & PEG 14, Larrea Tridentata (Chaparral) Leaf Extract, Hypericum Perforatum (St John's Wort) Aerial Parts Extract, Symphytum Officinale (Comfrey) Leaf Extract, Phytolacca Americana (Poke) Root Extract, Achillea Millefolium (Yarrow) Flower Extract, Arnica Montana (Arnica) Flower Extract, Melissa Officinalis (Lemon Balm) Leaf Extract, Salix Alba (White Willow) Bark Extract, Sodium Hydroxide, Lavandula Angustifolia (Lavender) Buds Extract, Ascorbic Acid, Tocopherols (soy), Edetate Disodium, Natural Plant Extract and Potassium Sorbate.